What: As it says on the tin, a caddie carries the bag, will be familiar with the course, and will be able to provide lines off tees and read the greens for you. The likes of Ballybunion, Royal County Down and Lahinch are tough enough, many with blind tee shots, so a caddie is really helpful. You will usually have the option of a ‘single’ caddie or a ‘double bag’ caddie; no need for an explanation there! You can generally also hire a ‘forecaddie’. In addition to carrying the bag, the caddie will usually be a great source of knowledge on all things local; sights worth visiting, where to eat, where to drink, where to see Irish music, etc. Usually will throw in a few good stories, some of whoch may even be true, as you walk the Irish links too. Cost: The average cost for a single bag caddie runs about €50 / $60 plus tip. The average cost for a double bag caddie runs about €80 / $95 plus tip. How much to tip? Dependent on service provided of course, but assume another €10 for single and €20 for double. 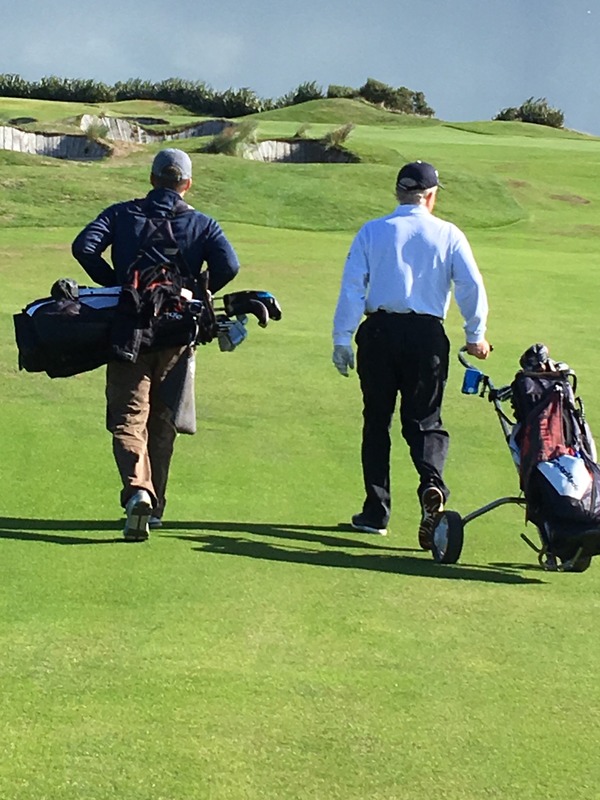 Pro’s: When golfing in Ireland, a caddie is definitely the best option if you can swing it. Will greatly enhance the experience, both golfing and in the other ways noted above. 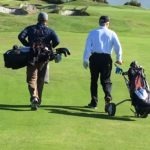 Other: Caddies are generally available at most of the courses you will golfing in Ireland. They must be requested in advance ~ which of course Real Irish Golf will do for you ~ and are not guaranteed. Oftentimes, depending on availability, courses will automatically assign double-bag caddies to groups. At some courses, eg, Adare Manor, Hog’s Head, caddies are mandatory. Payment is made directly on the day in cash. What? Carts are generally called buggies in Ireland; no, not the type you use for babies … those would be called prams over here! 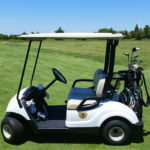 Cost: Golf carts average about €45 / $55 to hire. Pro’s: You’re not carrying and you’re not walking, so if you have any old war injuries. carts may be the way to go. Con’s: You’re not walking. Also reduced usefulness if you are a regular visitor to the towering dunes! In our (traditional!) opinion, Irish links golf courses should be walked if you are able-bodied enough to do so. Feel the spring in the links turf, take time to admire the great views, and generally absorb the experience. Other: Some courses do not allow carts. So don’t plan on riding in a cart at the Old Course at Ballybunion, Royal County Down, Lahinch and Royal Portrush. Real Irish Golf will check on the availability of carts at specific Irish links courses at your request. What: Very common/popular in Ireland, you walk behind these battery powered trolleys. Will comfortably get through 18holes, and the newer ones, 36 holes on one battery charge. 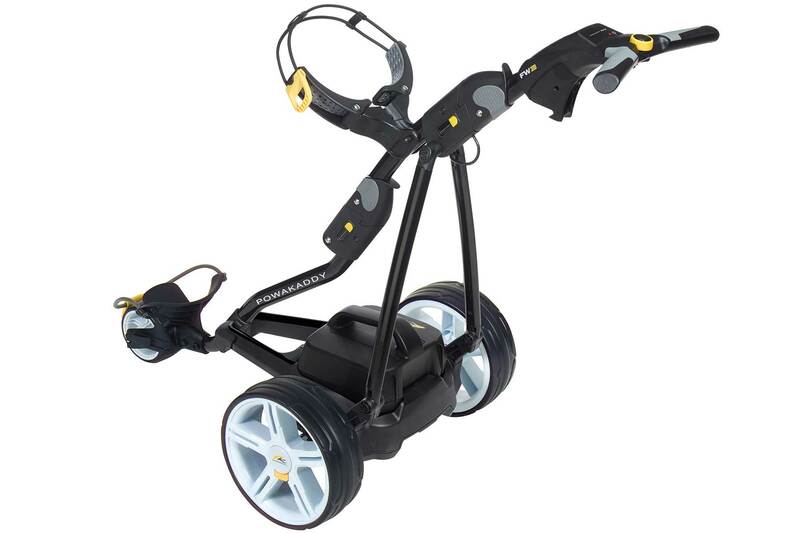 Popular models are the Powacaddy, Motocaddy and Golf Glider. 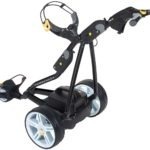 Cost: Battery powered carts average about €20 / $25 to hire. Pro’s: A great option if you want the experience of walking but struggle to carry the bag. Con’s: Hhmmm …. struggling to think of one. Other: The nicer ones also have GPS built in which is great when on an unfamiliar Irish links. What: Your ‘bog-standard’ push or pull trolley. Very common in Ireland and available everywhere. Cost: Average about €5 / $6 to hire. Pro’s: A great option if you want the experience of walking but struggle to drag the bag. Con’s: Frequent toppling dunes may be experienced when legging it up the dunes. So there you have; the information you need about caddies, carts (or are they buggies? ), trolleys and walking while golfing in Ireland. Still have more questions? Contact Real Irish Golf and we’ll set you straight. Previous PostGolfing In Ireland: Caddies, Carts, Buggies, Trolleys …. How much will it cost?